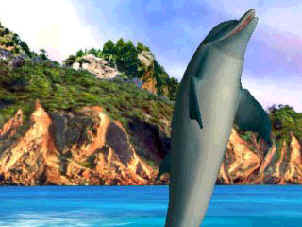 Remember the good old days when �Flipper� was on television? Ever since a kid I wish I could be Flipper and swim around the ocean meeting new friends. The closest I ever got to that was down Southend sea front�yet what was floating in the water certainly wasn�t sea life! And so Sega have brought back that magical game from the Mega Drive�Ecco the Dolphin. First things first�this is unlike any game you have ever played in your life. The developers want you to take time with it, they want you to relax and take in the gorgeous environments. They want you to think about what�s going on. However, this is instantly where Ecco will lose some of its audience. If you�re a �casual� gamer (I hate that word too) then you wont like this. This isn�t a game where you can pick it up and have a quick blast of play for 20 minutes like Powerstone or Crazy Taxi. So what is the game all about I hear you cry? Well the world is at threat from aliens and Ecco has to go back in time and prevent disaster from occuring. So it�s a poor story line but it gives Sega an opportunity to show off that 128-bit console nestling under your feet. To put it simply, Ecco is the most awe-inspiring game you will come across. The first time you take control of the little mammal is when you realise that this is something special. 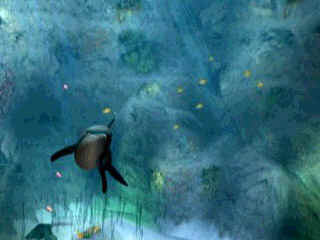 Schools of fish aimlessly go about (which you can eat to regain energy) and turtles glide through the water with ease. Then there are the sharks, which will attack, and puffer fish. This is a real ocean! The sound in Ecco is different to all games. Ever heard those relaxation tapes where you have the ocean in the background cruising over the sand? Well this is what Ecco is all about. Orchestras are used and sonars of other fish are just lovely. It feels like an ocean�the sound glides through your ear lobes. If your lucky enough to have your Dreamcast connected to surround sound speakers then you are in for a BIG treat. 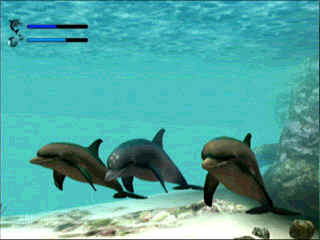 The difficulty in Ecco is where the game loses it big time. The first level eases you into the game. But as soon as you enter the next level you might as well try and solve a rubix cube! 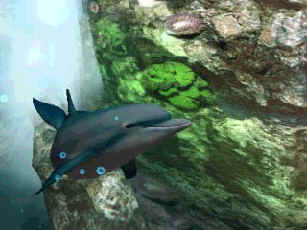 When you communicate to other dolphins using you sonar, you are treated to a riddle! If that isn�t bad enough then you will hate the size of the levels. Why it is nice to wander through the ocean enjoying the scenery, you will soon learn to hate it. I spent half an hour looking for a friend of mine! When I found him I wanted to alert the nearest tuna fishing company! Due to the complexity of the levels, and the way Ecco can move 360 degrees in any direction, then you�re looking at a very big level. Then you find out that if you hold the sonar button you are treated to a map, but the map is 2D and so is pretty much useless. If you reach the 4th level you will probably give up. Not because of the difficulty but because it becomes so frustrating that sticking your hand in a plug socket seems incredibly enticing! If the levels had some kind of landmark (like a certain coloured rock) then negotiating the tricky levels wouldn�t be such a pain. Perhaps I�m being too harsh. Yes the game is incredibly difficult and yes the levels are gigantic, but that is really the only faults I have. The Graphics are on a par with the likes of Soul Calibur and the sound is just wonderful. You could probably record the sound and make your very own relaxation tapes! The controls are simplistic too, with a simple tap of the �B� button to give you a dash of speed. The idea behind the game is clever too. For instance, when you are low on energy a quick dash into fish will replenish your health. Like all great games there is that magical moment. In Zelda on the N64 it was probably the first time you enter Hyrule field and get that great pan view of just how big and gorgeous the game was. In Soul Calibur it was the way in which the weapons had that great reflection as it's thrusted into an opponent. Well Ecco has its own. Picture this, you have no air and are at the bottom of the ocean. So you pelt it towards the surface. You see the sun and bang�your little dolphin friend jumps through the surface and does a spectacular roll as the reflection of the Sun blinds your eye. A truly amazing moment. And so Ecco is a game with its faults, but then it is a game with absolutely fantastic moments. It certainly won�t appeal to the mainstream audience, but then a special game needs a special audience. It can become frustrating, puzzles are too hard to solve and levels are too big, but you will forgive that when you hear Ecco talk to his little friends, because its just so sweet! If you�re up for a challenge then this is the game for you. Or if you simply want a completely different game to the fast paced action of Powerstone and Crazy Taxi then look no further. Certainly worth your time. 9 One of the best on Dreamcast, if not the best. Simply stunning and moves at a fast rate. Only slight slow down gives fault. Environments are just incredible. Sound 9 So relaxing you could sit there all day. Beautiful sounds but can become irritating if played for hours on end. Orchestras give lovely backdrops. Almost feels like the X-files! Gameplay 7 If you stick with it you will be hooked! (No pun intended!) However it can become tedious at times and many will throw down the controller in pure frustration. You would wish the RSPCA had never been created at times! Will last you an age if you keep at it, but once its done its done and will have no replay value. You will probably give up after a month! But well worth your �40. I got this game, put it on, loved every minute of it, until I got onto level 2, simply put, whoever approved the game has no idea of a learning curve, or in other words, it gets very tough, very fast! It�s not that it�s hard to control, it�s not that the camera is all messed up and you can�t see what you are doing, it�s just that the clues given are so vague at times, it�s impossible to work out what you�ve got to do, without the help of a guide next to you! This is a �graphic whore�s� dream! You won�t see such beautifully crafted levels for a good while to come! The music, is extremely atmospheric, and the game itself is, well, like no other Dreamcast game available. Basically, Craig says it all! The pans of early levels give you an idea of the scale the game is on! The bonus 2D perspective levels though, are just mind blowing! And probably reason enough to get the game, then just put your Mega Drive on a TV next to it, and just do a graphics comparison! The Mega Drive version wins hands down well, maybe not but it gives a very clear indication of the DC versions roots! Overall, for those brave enough, you have a challenge probably bigger and tougher than any other you�ve taken on so far, for the rest, of you, if you like fish, dolphins, killing sharks (in a nice way) and playing Dolphin Soccer then if the price is right, why not give it a spin? Just don�t expect to finish this game anytime soon!